We tested a variety of machines that play soothing sounds.Shop for the best white noise machines on the market for your bedroom for a better night's. ​We tested a variety of machines that play soothing sounds. Shop for the best white noise machines on the market for your bedroom for a better night's. If you struggle to sleep, but can’t stand night masks, then a white noise machine might be what you need. Almost a third of American adults get less than the recommended 7-8 hours of sleep per night. This is typically due to a variety of different factors such as sleep disorders, stress, loud noises, bright lights, etc. Many people turn to sleep masks and plugs to solve their sleeping problems, and, for the most part, this works. However, not everyone can sleep with fabric over their face and foam stuffed in their ears. It can get uncomfortable pretty fast. If ear plugs or sleep masks aren’t for you, then a white noise machine what you’re looking for. A reliable white noise machine easily filters out loud, blaring sounds to provide you a quiet, calm nights rest. Let’s take a look at some of the best white noise machines currently being sold. White noise generators come with a variety of pre-set noises that appeal to anyone who suffers from the lack of sleep. Certain white noise generators are built to help young newborns and toddlers sleep. Some are great for filtering out loud, boisterous neighbors, while others are perfect for silencing traffic. The best white noise machines come with both natural and unnatural sounds. If you’ve moved from a small town to the big city, some offer the sounds of birds and the wind. On the other hand, if you’ve moved to a smaller town, some machines offer the comforting blare of city traffic. No matter where you are, you always feel at home. White noise machines can vary in shape, size, weight, price, and features. In these next few sections, we’ll be comparing and reviewing some of the best white noise machines available. Our team of experts has chosen the top five sleep machines for those unable to sleep due to noise. Hopefully, by reading this you’ll get an idea of which is the best white noise machine for you. The Adaptive Sound Technologies Sleep Therapy System is one of the best white noise machines currently available. This is due to its simple, easy-to-use control panel and compact, lightweight design. It’s equipped with ten sound profiles, each 30 minutes in length and featuring two different variations in tone. This makes a total of 30 profiles and up to 15 hours’ worth of white noise. Its sound story offers the option between a basic sound pallet and one made up of numerous, distinctive sounds. This varies based on how loud or quite you’d like your sleep machine to be. The louder the white noise generator the more noises will be added. This can include sounds like birds, bells, cars, wind, whistles, and rain. Its patented Adaptive Sound Technology automatically adjusts the volume based on the noise in the environment. The pre-set sleep timer has four-timer actions, which includes 30, 60, 90, and 120 minutes. The HoMedics Spa Relaxation Machine comes with six pre-set natural sound profiles. Equipped with an A/C power cord, this white noise generator runs on both electricity and 4AA batteries. Its built-in timer has 15/30/60 minute intervals. Featuring easy-to-understand, straight-forward controls, this sleep machine turns on and off via the volume switch. Although not a high-end product, this sound machine is affordable and fairly easy to use. HoMedics Spa Relaxation Machine is the best white noise machine for those looking for an affordable, simple product for their home or office. The Marpac Dohm is possibly the oldest product on our list. Designed in 1962, it’s the 4th generation of Dohm manufactured white noise machines. It’s been dubbed the Official Sound Machine of the National Sleep Foundation for the past 50 years. This sleep machine features a dual speed design for better tone and volume. Its acoustic housing helps to amplify the light, airy tones of the preset sound profiles. This sleep machine uses ten unique fan sounds and ten white noise tones. Equipped with an 8” extension cord, this white noise generator is electrical powered and can also charge via USB connection. No matter where it’s taken or used, the Marpac Dohm-DS always plays clearly to ensure a well-deserved night’s sleep. The LectroFan Jr. is truly one of the best white noise machines for infants and children. Equipped with twelve sound options and eighteen pre-set classic rhymes, these sleep machines are great for any nursery setting. It features multiple volume levels, as well as, a 60-minute timer that shuts off automatically. Compact and light weight, the LectroFan Jr. can be taken anywhere and at any minute for quick, last minute uses. Do you have to take your toddler to the office with you? Why not take the sleep machine, too. It can entertain any child for hours, without distracting you from your important work. What’s even better is that it comes with an A/C power cord the converts into a USB cable. This is great for playing songs via your computer, laptop, or iPad. Multi-functional, convenient, and easy-to-use, the Lectro Fan Jr. is a great option for any home or office setting. Made of a reflective, durable plastic, the Graco Sweet Slumber is the best white noise machine for complementing any setting. Equipped with twelve soothing noises, this sleep machine also offers a USB and MP3 option for playing your favorite music. It’s A/C powered, as well as USB chargeable for convenience and simplicity. It also comes with a built-in night light for soothing young children to sleep. Like most white noise generators, the Graco Sweet Slumber Sound Machine is lightweight, compact, and features an automatic shut-off timer. It’s the perfect option for anyone looking for a simple, affordable product for their children. A reliable white noise machine perfectly blocks out noise, allowing you to get a quiet, calm night’s sleep. This is great for blocking out noise in the room next-door, in the neighbor’s apartment, or outside your own window. With a great sleep machine, they’ll be no need to worry about loud parties or annoying city traffic. No matter where you live, you’re guaranteed to get the best sleep with every use. If you can’t sleep due to anxious thoughts and stress, white noise machines are great for relaxing your mind. It helps to soothe the brain and lure you into a peaceful slumber. It also helps you to relieve your stress, so that you wake up eager and ready to handle the new day. Some of the best white noise machines offer MP3 compatible functions or are pre-set with nursery rhythms for children. They can entertain your toddlers while they’re awake, and soothe them when it’s time to sleep. It’s a great function for the busy parent who may need to take their kid to work with them. Simply set your child in their crib or playpen, and turn on the white noise machine. They’ll be happy and delighted throughout the working day. It’s not uncommon for individuals to fall asleep with their TV on. This is actually considered pretty bad for you due to the exposure of unnatural light during the night. Sleeping with the TV on may block out irritating outside noises, but it damages your circadian rhythm or internal clock. In the long run, this can cause depression, anxiety, confusion, deliria, and sickness. A good white noise machine can block out sound without damaging your internal clock. Although some do come with a faint nightlight option, this can shut-off or is faint enough to cause little damage. White noise machines are incredibly helpful in a workplace setting. Much like elevator music, white noise sound profiles play peacefully behind you while you work. This can keep you calm and relaxed during a busy, hectic work day. What’s great is that you can use your white noise machine in any setting to keep you focused and happy. When people think of white noise machines they think of anything from static to thunderstorms. All of this is true. White noise is any random sound that has an audible intensity of 20 to 20,000 hertz. It must contain multiple frequencies, each with equal intensity, and it can be used to mask background noise. People tend to use soothing forms of white noise like birds, rain, and the sea, to drown out more irritating noise like cars or shouting. It may seem a little strange, but when there’s loud intrusive noise, you play white noise to drown it out. Adding MORE noise to the problem doesn’t seem like a likely solution, but it works! White noise works to drown out irritating background noise. You see, it’s not the loud noise that keeps us awake, but rather the content and inflections to it. Our brains are trained to register alarming noises that warn us to wake up immediately. It’s why you can fall asleep with the TV on loud, but a car horn can startle you awake. What Are The Types Of White Noise? As stated before, there are multiple types of white noise. The three most common that are featured in white noise machines include machinery, nature, and ambient noise. Machinery: Machinery white noise is typically less popular as it’s usually not needed. It covers the range of noise for household and office appliances. This can include air conditioners, dishwashers, washing machines, and dryers. Nature: Nature is by far the most popular form of white noise. This is mainly because it’s very soothing and great for falling asleep by. This can include all forms of natural nature sounds, such as birds, wind, rain, the sea, thunder, etc. Ambient: This is another unusual form of white noise. It includes less-natural, people-related noise such as crowd noise, traffic, aircraft carriers, campfires, etc. There are other types of white noise, but these are the three most common forms used in white noise machines. Nursing rhythms, classical and soothing music are also popular options that drown out intrusive noise. This is great for entertaining and calming young children. Noise pollution is considered irritating levels of sound that can cause harm or accidents. Most forms of noise pollution are caused by machines, motor vehicles, or trains. Many individuals grow accustomed to urban noise and are able to sleep through it. However, some studies suggest that even though you can sleep through it, you’re still not getting a healthy nights rest. Constant sleep irritations can cause hypertension and anxiety. That’s why it’s important to incorporate a white noise machine into your sleeping habits. Ear plugs and eye masks are another popular options. How To Manage Family Noise? Families are wonderful, but they do nothing for building stress and lack of sleep. While a white noise machine may help to filter out noise, sometimes you need to take a more active role. If you have children, consider putting them on a regular sleep schedule. This is both good for you and them, as children need at least 8 to 9 hours of sleep at night. If you have a baby, don’t worry about not hearing them over the sleep machine. Simply turn the volume down or consider purchasing a baby monitor, as well. Where Can You Purchase A White Noise Machine? Online on Amazon: Consider purchasing your white noise machine via Amazon. We’ve attached links to for each top rated white noise machine on our list. If none of these stands out to you, you can also browse through Amazons options. In-Store: Try searching for in-store white noise machines. Some of the best white noise machines on our list are also sold in well-known stores such as Sears and Walmart. Electronic, home-focused, and large multi-commercial stores are the most likely to sell white noise machines for low, affordable costs. Manufacturer’s Website: Try purchasing the white noise machine off the manufacturer’s website. They may offer warranties and discounts, as well as, money back guarantees. What Are Alternatives To A White Noise Machine? If a white noise machine isn’t all that appealing, consider purchasing an eye mask with ear plugs. This is a cheap and affordable option that’s great at filtering out both light and noise. However, I wouldn’t recommend earplugs if you have young children. If you don’t have a baby monitor, you might not hear them if they wake up at night. When choosing the best white noise machine, we had to consider what was most important for the general consumer. We took time to read through customer reviews and testimonials to figure out which worked best and lasted longer. There are numerous factors that can determine which was the best white noise machine for you and your family. We decided to look at three specific things: performance, portability, features. By performance, we mean how well your white noise machine masks background noises. This can include volume, variety of sound profiles, and clarity of the white noise. We looked out how long the profiles lasted and how well they lured both adults and children to sleep. This is important for obvious reasons as a low quality white noise machine won’t be able to perform, as well. This is an important factor to consider if you have young children that you sometimes take to the office. The best white noise machine should be compact, lightweight, and portable. Some people get attached to their white noise machine and can’t fall asleep without it. That’s why it should be small enough to take with you on trips or vacations. For those who often travel for work, you might have to stay in an unusually loud or quite hotel. A white noise machine can help you sleep when you’re in an unfamiliar location. Portability also takes battery and A/C power into consideration. If your white noise machine runs on batteries, than how long does it last? How often does it need recharged? What type of A/C cord does it need and how cheap are they to buy? These questions all come into play when determining the convenience of the white noise machine. This category can include complementary accessories or features that make using your white noise machine easier. Features include nightlights, variety of sound profiles, detachable A/C cords, etc. We asked questions such as rather or not they can take both A/C cords and batteries. If not, then can the cord transform into a USB cord and if so, can it play MP3’s? Can it play songs on your laptop, tablet, or phone? Also, can your white noise machine shut-off automatically? If so, what are the intervals? Warranties and money back guarantees also fall into this category. Quite a few white noise machines on our list are covered by warranties that protect against material and workmanship defects. This is important because it guarantees that you get what you pay for in a white noise machine. As stated before, white noise machines vary based on numerous factors such as size, price, and features. Choosing between them can be a bit confusing, if not frustrating. Although they may differ, the end result is always the same: they filter out background noise for better sleep. When choosing the best, we had to consider how well they filtered out noise and where they can be used. 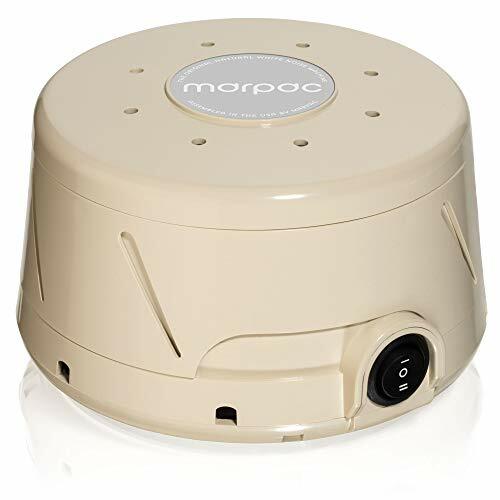 We decided that the best white noise machine for sleep was the Marpac Dohm-DS All Natural Sound Machine. The Marpac Dohm-DS is considered the Official Sound Machine of the National Sleep Foundation. It has held this title for the past 50 years and it’s easy to say that it deserves it. Compact, powerful, and lightweight, this noise machine can play both preset sound profiles, as well as, downloaded music. It’s dual speed and acoustic casing provides rich, beautiful white noise with every use. It’s great for calming both kids and adults, and it can even be used in either a home or work setting. The Marpac-Dohm-DS is the best white noise machine for any individual, family, or office. If you enjoyed this article, I encourage you to write a review. Have you purchased a white noise machine before? White did you buy? How did you like it? Would you ever recommend a white noise machine to your friends and family?